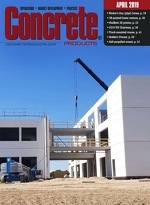 If 2013 World of Concrete exhibitor booths are a barometer, this year will see ready mixed producers move on two capital investments: mixer trucks and roller compacted concrete-ready portable plants. The February 5–8 gathering at the Las Vegas Convention Center saw the unveiling of truck models from Oshkosh Corp., Terex Roadbuilding and category newcomer Putzmeister America. Oshkosh showed the industry’s first compressed natural gas-powered front discharge mixer. Like the Ngen (Next Generation Initiatives) rear models McNeilus Cos. has refined over the past three years, the S-Series Ngen runs a Cummins-Westport ISL-G 8.9 liter engine with 320 hp, and features an 11-yd. McNeilus drum with 45-in. opening. A five-axle model, the premier truck has been sold to Action Ready Mix Concrete in Bohemia, N.Y.
After what company officials noted was a tough, three-year stretch at the Terex Advance flagship in Ft. Wayne, Ind., Terex Roadbuilding unveiled two front discharge mixers: the five-axle, FD5000 "Great Lakes" model, with 197-in. wheelbase, and six-axle FDB6000 bridge formula model with 206-in. wheelbase and rear tag axle. Both are available with EPA 2013-compliant Cummins ISX12 or MTU DD13 engines, and part of a six front discharge model offering—streamlined from a pre-recession 13 model line up—to which Terex has retooled its Ft. Wayne operation. No stranger to concrete placing, pump manufacturer Putzmeister America chose World of Concrete to mark its entry in mixer trucks. The Sturtevant, Wis., manufacturer has launched in the delivery category with two models: the Pro Series standard truck, featuring 43-in. drum opening, and Bridge Maxx Series, featuring 47-in. drum opening and booster axle. Putzmeister America announced mixer truck production capacity in Wisconsin late last year; demonstration Pro Series and Bridge Maxx Series models will be dispatched on the home turf and in California this spring. Oshkosh, Terex Roadbuilding and Putzmeister America joined competitors and heavy-duty truck OEM to bring the largest collection of mixer trucks for a World of Concrete in years—matching or exceeding the number of such vehicles that might be shown at a typical ConExpo-Con/Agg. As mixer trucks were concentrated in the Las Vegas Convention Center central hall, the north hall saw a collection of trailer-mounted twin shaft or horizontal mixer plus conveyor packages—all geared for roller compacted concrete pavement projects—from brands including Vince Hagan Co.; Liebherr Concrete Technology; Loadcraft Industries and BHS Filtration; Rexcon LLC; Stephens Mfg. ; and, Sicoma North America.